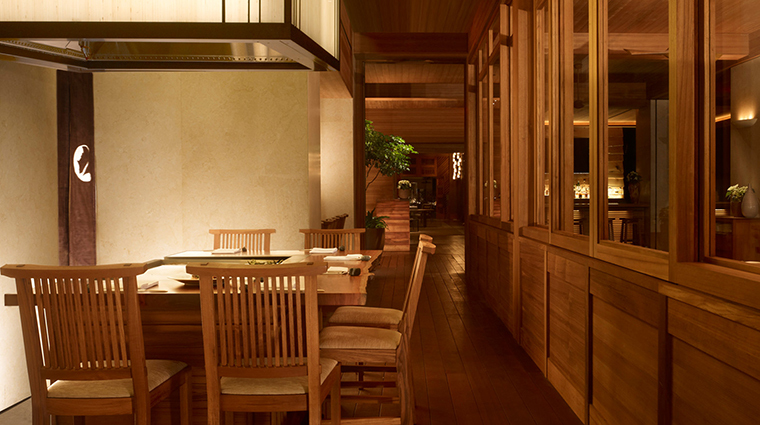 Highly esteemed chef Nobu Matsuhisa brings us yet another outpost of his high-end Japanese restaurant with Nobu Lanai. The restaurant, which opened in 2012 at Four Seasons Resort Lanai, serves classic dishes as well as ones exclusive to the Hawaiian locale. Set on the lower lobby of the luxury resort, Nobu is only open for dinner, but it offers cocktails and snack options starting at 5 p.m. on the patio. Go there before dinner to watch the lighting of the torches, an event that occurs nightly at sundown, while sipping refreshing drinks like the Peruvian caipirinha finished with shisho and ginger beer or the lilikoi margarita made with passion fruit. Nosh on Nobu favorites like the skewered, cube-shaped crispy rice with tuna, served in a parchment-paper-lined logoed box with a side of soy sauce and wasabi — a treat that complements the flavorful drinks and gorgeous setting. 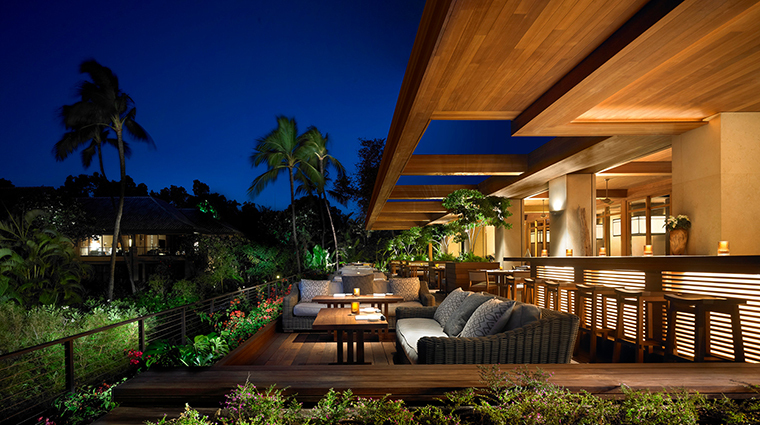 Nobu Lanai offers different seating options depending on what you’re in the mood for that evening. 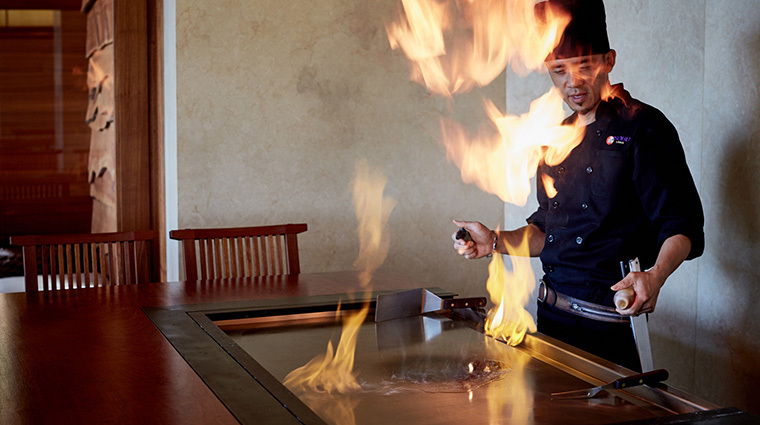 Teppanyaki, a style of Japanese cuisine where a chef cooks the dishes in front of you on an iron griddle table, is one of the more interactive and fun options. 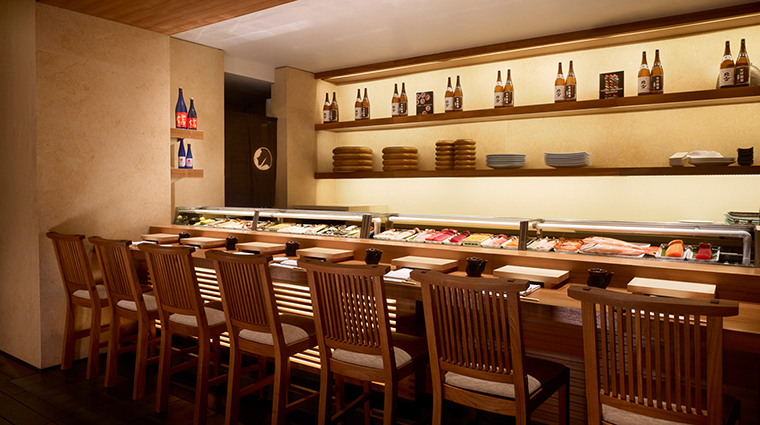 For a quiet, peaceful meal, opt for the sushi bar seats where the highly trained chefs prepare sushi and sashimi with the distinctive Nobu flair of incorporating accents of global cuisine. Of course, regular tables are available, but our choice seats are the cushioned lounges along the edge of the balcony. There, you can feel the gentle ocean breeze while you enjoy your meal. The Lanai restaurant’s inventive global take on Japanese cuisine has achieved worldwide fame for good reason: The food is fresh and delicious. If you have your heart set on Teppanyaki at Nobu Lanai, just be aware that you need to reserve your table at least 24-hours in advance. The menu is divided into hot and cold dishes, and the kitchen recommends starting with the latter. 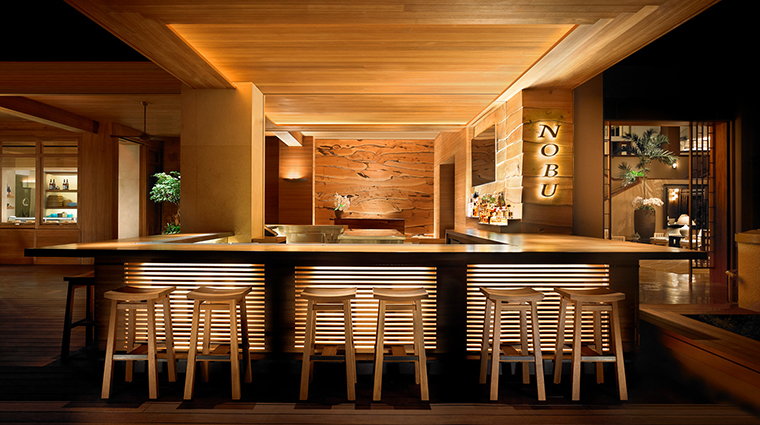 The dress code at Nobu is resort casual, but you wouldn’t be out of place in a breezy dress or slacks and a button down. 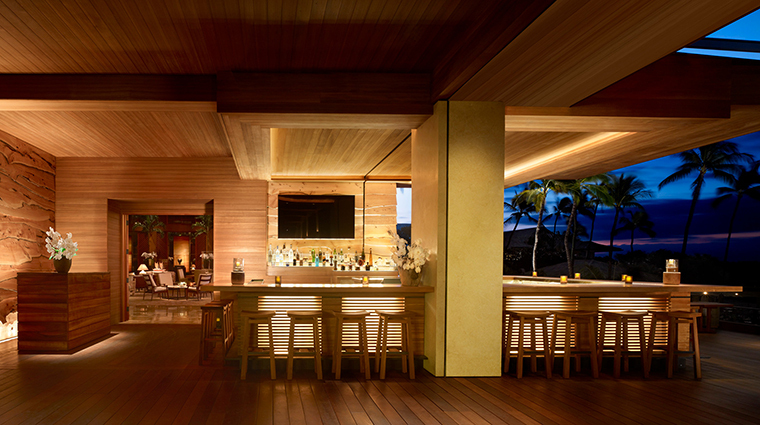 The Hawaii outpost of chef Nobu’s world-famous eatery serves dinner from 6 until 9:30 p.m. nightly. Check out the left side of the menu to see many of the dishes that Nobu has become known for, such as the yellowtail sashimi crowned with thin rounds of jalapeño, but don’t miss the local list in the center of the menu that celebrates the island’s produce and seafood. Coming in single servings, the uni shooters are topped with quail eggs for a blast of umami that’s an ideal way to start off the evening. If you want a shareable dish, order the kona kampachi, which is served raw in a circular design and topped with a Maui onion salsa, a touch of truffle oil and fresh greens. Try the tuna tataki, lightly seared on the outside and finished with Maui onions and ponzu sauce for a sweet and salty bite. To make it a special evening, pair the meal with sake bottled exclusively for Nobu — it goes well with the fresh and flavorful seafood.